Brace yourselves, kids. This is a long one. After fantasizing for months about getting to have the opportunity to be with J-Man every day and all of the cool things we would do, the time is finally here. If I am honest, the transition has been a little hard on me. My job was hyper busy. Each day I would leave work feeling like I had run a marathon. I was exhausted mentally and physically, and sometimes even emotionally. Fast forward to August. I talked about this overwhelming feeling to do everything with several stay-at-home mom friends recently, and the consensus is that it is really easy to get seduced by the idea that there will always be time to do more. The reality is, that the days get away from us when we don’t plan. So while I have the freedom to do anything, maybe I need to develop the discipline to narrow the focus and finish what I start. So in the interest of trying to organize myself I am putting to use the planner that I bought at the end of the school year to use at work, but this time, it is for my new job as Momster the Super Mom. I bought this planner from Erin Condren, and I have to say it is not cheap. 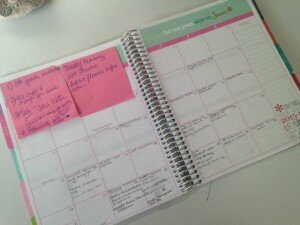 However, there are few planners on the market that have the customability and versatility that her planners offer. The video is positively seductive. I was convinced that upon purchase, I was going to have a transformative experience where the angel of organization would visit me with a gold pen to write appointments. Never would I double or triple book myself again. And…no angel or gold pen, but I was rocking it with a pencil. Here is an example of a page from my last month at work. Notice I have appointments! I was (semi)organized! If you worked with me previously, we don’t need to go into the hairy details of what semi looked like! Now I’m planning for a move to a new house, a hopefully really cool creative gig, J-man social and gym calendar and we are already booked up again! Sometimes, because of not keeping track, I have double booked the J-Man for social engagements for the same day, not allowing him much downtime in-between as we rush from one side of the Tampa Bay area to another. I clearly need a plan. Maybe, but after six years of often not having anything in the house for dinner, we have settled into a bad habit of fast food and eating out. So, this is now a priority. I swear that kid does more than I did in college. Of course, I was kind of nerdy, and there were a couple of periods when I had three jobs, but the long-winded point is, HE GOES OUT. We have to tame this socialization beast. I have pretty much accepted any and all invitations for us over the last month. Gym/Fitness: I have not made this a priority since J-Man came into my life. The reality is this: how can I teach him independence and how to take care of himself, if I am not taking care of myself? He is going to have to see that taking care of yourself is important. I want him to grow up to have a healthy relationship with his body, and the best way to do that is to develop that in myself. Well, at some point we have to put the school in the home school. This will probably not include too much of me teaching and him sitting doing “work”, but I have to make sure not to overschedule him, or we won’t have time for spontaneous discovery and in-depth exploration. I have already found that the library is great to get him started. This will also include field trip times like when we go to the causeway at low tide to see the sea critters up close. Now that Hubs is working more on top of his class load, we need to be careful to schedule time for Jack to be with his daddy. I kind of want to see him too. When my fairy godmother drops in, I swear there will be a housekeeper twice a week. Until then, someone has to vacuum and do laundry. I put this waaaaaaaaayyyyy down the line in importance. I’m totally ok with dishes in the sink if it means a really cool experience with the J-Man. I need some chardonnay, Netflix and sitting time as well. Most importantly this needs to not be at 2:00 AM. So, how is this all going to happen. Well, I’m going to need some self-discipline and to really use this planner. I am also going to use the daily features that separate the day into morning, afternoon, and evening. I am going to start with the hubs’ schedule. This way I will guard some daddy-boy time in our daily schedule and add in all the other things we need to do. What do you use to keep time sacred for what is important to you? I had to make time with my husband important by getting up after putting the kids to bed. Our plan is to spend 30-45 min. every other night. We have some alone time and watch funny shows. When I didn’t make him a priority, our marriage fell apart. I learned to have happy kids, it’s also important to have a happy husband. Granted, I have very little me time, but that was the understanding if I wanted to stay home.